Note: Since chayote has a mild taste, the chili pepper or chili flakes will add additional flavor. Prep ingredients before cooking. Mince garlic, scallions, and jalapeño pepper (if you decide to use it). Fine chop cilantro. Skin chayote and remove seed. Medium dice chayote. Put butter, scallions, garlic, and jalapeño pepper/ or chili flakes in a sauce pan. Cook on low for four minutes. Stir occasionally. Mix in the diced chayote, a sprinkle of salt, and third of the cilantro. Cook for a few more minutes, and then pour in the cups of water. Chayote soup ingredients, before water has been added. Turn up the heat, and simmer the soup for 20 minutes. Stir periodically. Make sure that the water hasn’t evaporated from the sauce pan. Add a ¼ cup more water, if necessary. If more broth is desired, put in additional water. (The more broth, the thinner the soup. It's a matter of preference.) Cook until chayote becomes tender. Carefully pour the chayote, broth, and the rest of the cilantro into a blender. Make sure the top of the blender is on tightly. Hold down the top while blending. Puree, or pulse, the soup for 1-2 minutes. Taste the soup; add more salt if needed. 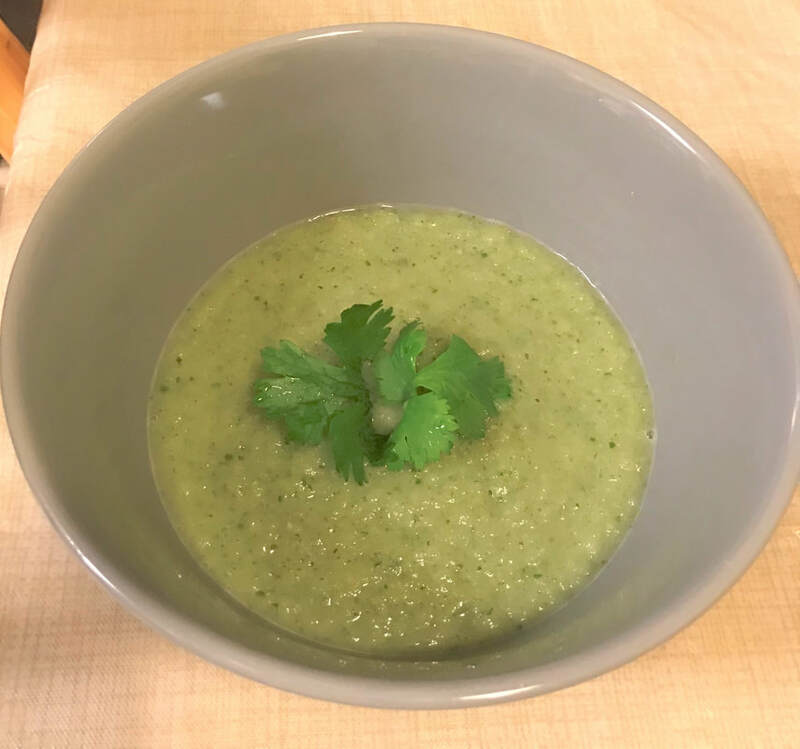 Garnish chayote soup with cilantro leaves. Serve. Chayote is a squash that is a Mexican native. It's popular in Asian cuisine. Chayote is low in calories, high in vitamins B, C, and fiber. Small dice half of the onion. Mince the garlic. Wash the chard leaves thoroughly. Chop the chard leaves and stems. Slice the cherry tomatoes into eighths. Turn the burner on medium-high. Pour 2 teaspoons of vegetable oil to a frying pan, and let it heat up. Begin sautéing the diced onion. After a few minutes, add the minced garlic. A minute later stir in the chard leaves and stems. Sauté these ingredients for about five minutes. Toss in the cherry tomatoes last. Sprinkle in a pinch of black pepper. Stir and serve.